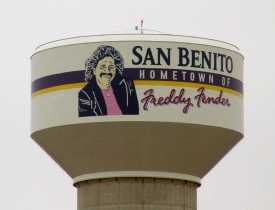 "San Benito - Hometown of Freddy Fender"
I can understand why some people may not know much about Freddy Fender, after all I count four other names he has performed under and his career has started and stopped several times. But there is no doubt Freddy is a true Texas grown talent that has left, and continues to leave, his mark on Texas music history. When he sings his songs in alternate Spanish and English it demonstrates his power and talent. 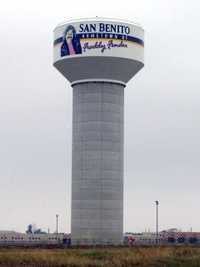 Freddy Fender is probably the greatest singer, writer and musician of Mexican-American heritage. Born Baldemar Huerta, in 1937, he started his musical career as El Be- Bop Kid, then Freddy Fender, later Eddie Medina and finally Scotty Wayne before he settling on Freddy Fender. He won a $10 tub of food (first prize) in an amateur talent contest at the Grand Theater in Harlingen. At 16, he joined the Marines for a three year stint. He returned to San Benito in the late 1950s, becoming a popular performer. He wrote Ay Amor (Holy One) in 1955. When this was released in the Spring of 1957, the flip side was No Seas Cruel (Don't Be Cruel). Freddy wrote and recorded Secret Love which was also recorded by Doris Day. His records played in the Rio Grande Valley, Texas, Mexico, Central and South America and were credited with initiating Tejano music. "No Seas Cruel" went to number one in Mexico and throughout South America. Hispanic rock and roll was born, and Freddy Fender was its Padre. As a guest at Louisiana's Angola State Penitentiary (for marijuana possession) Freddy served three years - writing at least three songs while an inmate. Released by Governor Jimmie Davis and barred by his parole from being involved with the music industry for awhile, he returned to San Benito where he went back to school and became a sociology major. It was in 1974 while Freddy was living in Corpus Christi, that he recorded Before The Next Teardrop Falls. His follow-up single was Wasted Days and Wasted Nights. Since I Met You, Baby was Freddy's third cross-over single. Freddy is part of the Texas Tornados - an on-again-off-again project. Freddy is one of a handful of voices like Willie Nelson, George Strait, Roy Orbison, The Big Bopper and Buddy Holly - voices that define the "Texas Sound."